Yesterday afternoon, Ford School Professor Paul Courant was named interim provost and executive vice president for academic affairs of the University of Michigan. This isn’t Courant’s first stint as provost. In 2002 he held the post, and served in that capacity until 2005. During that time, he negotiated U-M’s transformative book-scanning project with Google; guided the university through a revision of its undergraduate admissions process (in response to the Supreme Court’s 2003 decision in Gratz v. Bollinger); and provided key fiscal leadership during a period of declining state appropriations. Want to know more about Courant’s many contributions to U-M and the Ford School? Here’s a brief primer, so we can all be au courant. A long-time faculty member at the University of Michigan and Ford School. Courant was first hired as an assistant professor of economics (LSA) and a research associate (Ford School) in 1973. He had just completed his PhD in economics at Princeton University and a term of service as a junior economist on the President’s Council of Economic Advisers. His early scholarly work focused on the economic implications of racial prejudice in urban housing markets. A former director of the Institute of Public Policy Studies (IPPS), now known as the Ford School. Courant served as director twice, from 1983-1987, and again from 1989-1991. During his tenure, the school hosted its first summer institute for diverse undergraduate students interested in careers in public policy and international affairs (the school has run the program every year since); launched its one-on-one writing instruction program; established new mechanisms for maintaining alumni relationships (including the alumni board); and received authority to make tenure-track faculty appointments (laying the groundwork for the institute to become a freestanding school several years later). A former dean of libraries (2007 – 2013). Courant is a highly regarded leader in library development, digitization, and scholarly communications. During his tenure as dean of libraries, Courant oversaw the development of the HathiTrust, the world’s largest digital library. A collective digital library, with dozens of academic partners beyond the University of Michigan, Today, HathiTrust holds 14.8 million digitized volumes. It has also provided open access to 5.7 million volumes in the public domain, including almost all of the universities’ rare historical collections, for anyone with an internet connection. Designer of “Systematic Thinking: Problems of the Day,” an innovative course first introduced in 2006, Courant helps undergraduate students use social science tools to explore a series of timely policy challenges under the guidance of U-M faculty experts. 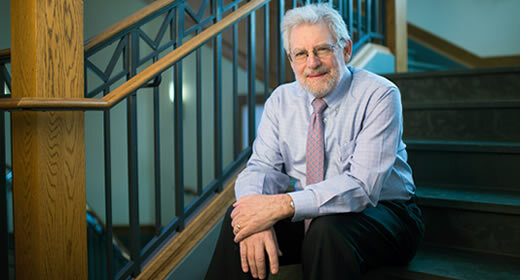 He has taught the course for more than a decade, and with co-instructors from law (Jack Bernard), education (Deborah Ball), policy (John Chamberlin), and many other disciplines, he has introduced more than 1,200 students to important policy challenges including electoral college reform, No Child Left Behind, globalization, and more. Courant will begin his term as interim provost on February 1, and President Mark Schlissel has signaled his intent to recruit a permanent replacement by the start of the fall 2017 semester. So we congratulate Courant on the appointment--knowing that U-M will be in good hands during his tenure--but we also look forward to welcoming him home soon.